Shawn and I painted the toy closet in our home for our grandkids, Arileise and Richard. After 15 yrs. in our home we have finally painted the dingy toy closet, previously the game closet while our kids were growing up. It's not perfect but I think it's perfect for us. The toy closet before the paint job. Our home is over 100 yrs. old and a few areas are still original, this closet is one of them. The bookshelf basket that I bought this Summer at the flea market for $5. Our grandkids love to read. The toys and stuff got moved to Shawn Jr's old bedroom. We washed the walls, puttied, sanded, and washed the walls again. Before we moved everything back into the closet. The newly painted toy closet for our grandkids, Arileise and Richard. This is all their toys at our home, a few we bought for them over the years and a few from our kids younger years. We already owned the paint, the bookshelf basket, and the decor. We used the leftover robin's egg blue paint from our bathroom. 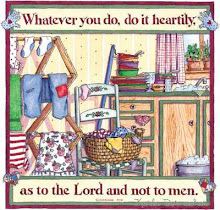 The scripture picture that I had in my closet for several years works nicely with the wall color. We put the books lower that we originally had them. The new light fixture that we got at the thrift store for $4, a longer chain $5, and a package of hook eyes $1. Shawn used eye hooks to make the chain easier for the kids to use. We still need a kick guard for the door and a pulley for the chain. It'll have cost us $15 for this project once we get the other items.